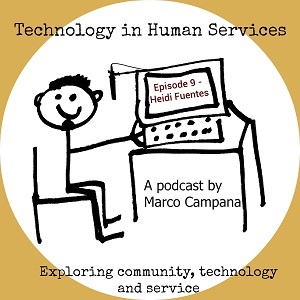 Welcome to Episode 9 of the Technology in Human Services podcast! In this episode, I talk with Heidi Fuentes, Online Services Program Manager at COSTI Immigrant Services. I learned a lot from Heidi about what it takes to move existing services online to meet the needs of clients who many never set foot in your offices. COSTI’s success is a great example for all human service organizations about what is possible, and desirable, when looking at online service. She shares many lessons and insights about what it took to make COSTI’s services successful. COSTI started offering online services in 2004. If that seems like a long time ago in technology in human services years, it is. Listen, and learn how you can find that same success in your services. A lot of COSTI’s clients were isolated, and couldn’t come into offices for in-person services. Creating online services became a way to deliver services in a different way and reach them. The experiment worked out, especially in terms of outcomes. What they also found was that they reached clients who had never used COSTI’s services before – strictly online clients. Clients reported that the information they got from the online courses helped them to find work. That’s what service is all about, right? Client outcomes. If your use of technology can enhance client outcomes, there should be no doubt about using it. The shift online wasn’t as arduous as you might think. Heidi says the strategy was to take in-class workshops and courses and use the information, resources and services and adapt them into the online system. Eventually they also started adding additional topics that were online-only. It’s important to note that the effort to shift courses online is part of the knowledge that already exists in the organization. Staff have the skills, knowledge and experience to develop the online courses. Some of the challenges were more around how to make online courses interactive, in the online space. But, the core of the service was already there. Staff just needed to look at another service delivery channel. Once they found it, the transition was smooth. COSTI has been using Moodle since the beginning of their online services to run their online courses. Moodle is an open source Learning Management System (LMS). That means the system itself doesn’t cost anything. There are technical costs (such as website hosting) and you have to keep up with upgrades to the technology, new features and changes to the administration, and train your staff. But, the ongoing costs of using open source technology like Moodle is very inexpensive. Heidi says it’s important to stay up to date with the technology you use. Moodle.org is a useful resource to stay up to date. COSTI also has a Moodle consultant that helps keep them up to date, runs tutorials and training for COSTI staff. Importantly, they created a staffing model that is built on sustainability, redundancy and shared responsibility. All thirteen COSTI employment facilitators run their courses. There isn’t simply one online employment counsellor. They contribute content, facilitate the courses and interact with clients. Together with Heidi, they manage the curriculum, develop the courses and assist clients. They all go through training to ensure they’re comfortable facilitating online and using Moodle. All are involved with the courses and service development. It’s simply part of an existing staff position, one that provides services both in-person and online. Initially, there was some resistance, as staff were worried about extra workload. But, over time, they’ve seen that online is the way to go. They can be more innovative in their service delivery and they see how offering innovative, flexible services meets client needs. 50% of clients are existing clients, referred from in-person services, who see online services as a supplement to their in person services. 50% come are online only, coming from community and self-referral. They are looking for specific interventions or courses, not interested in coming in for services. They also see pre-arrival newcomers, who are preparing for their arrival. You have to be skilled at using the technology you choose. You have to be creative, think outside the box, when using the technology. Be innovative. You can maintain the personal touch with online services. Get to know your clients, in an online forum, to make the social connections, working to create trust and community during the course. Be as resourceful as possible. Stay in touch with clients, interacting with them and keeping them engaged. You can still interact in very personal ways with clients online. They use Knowplace in BC for Moodle training. But they’re also building their own knowledge. For example, not all staff will take training at the same time. Those who do train and coach their colleagues on what they’ve learned. They also worked with an elearning consultant to create an introduction to online facilitation course. New staff are trained using this curriculum to get up to speed on COSTI’s services. As new tools emerge, the team looks at how they might be used with their clients and integrated into their services. For example, while their courses are asynchronous, they also use real-time webinars. The team’s experience has spread across into other services. For example, Moodle is being used to deliver Enhanced Language Training courses, offering sector specific technical language training. It’s a hybrid program, partially in class and partially delivered online. Youth services are also delivering online employment courses, adapted for a youth clients, delivered online. Heidi’s advice is to make sure you assess client needs first. What are you trying to do online? Needs of the clients comes first. Find out what technology clients are using. Do your research to make sure what you’re developing fits with client needs, interests and technical capacity. Invest in your staff. It might be challenging at first to get innovation flowing, but when you are focused on client needs, staff will eventually recognize that it is important to be responsive to their needs. Make sure you support them with training and build an internal Community of Practice. Don’t lose your personal touch. Be creative with how you engage clients online. Communication should be easy, fun, comfortable for staff and clients.